As the annual kick-off to Spring approaches and even though consumers are watching their spending, Meijer is still expecting strong sales for Easter basket goodies including candy, toys, and flowers. Customers are finding fun ways to personalize Easter décor and treats for their families now through April 20th. •	Garden: As warmer weather arrives, everyone is eager to get outside and start planting. Meijer expects to sell 15 million annuals at its garden centers as shoppers prepare their gardens and get ready to enjoy the holiday outdoors. 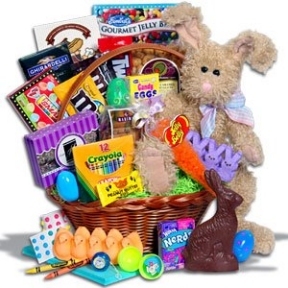 •	Candy: Not surprisingly, the Easter bunny loves to fill baskets with candy and sweet treats. Meijer expects to sell more than 1 million Easter bunnies this year, with jelly bean sales expected to hit 160 million – that’s more than 990 miles of jelly beans! •	Grocery: As shoppers prepare their holiday meals, Meijer expects to sell more than 3.5 million pounds of ham. The majority of shoppers, more than 85 percent, celebrating Easter will spend an average of $43.18 to feed their loved ones. •	Toys: Stuffed animals and games continue to be popular in Easter baskets among children of all ages. Through the Meijer “Save the Bunny” campaign, customers can save on favorite gift items from Fisher-Price. •	Apparel: Eager for a style refresh, consumers will kick off their winter boots and purchase spring dresses and shoes. Children’s dress sales are expected to rise, along with bright clothing for the whole family.